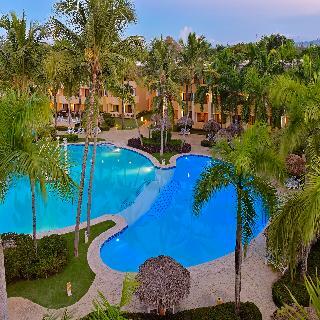 This luxury resort located in Costa Dorada on the North coast of the Dominican Republic just 10 minutes from the city of Puerto Plata. Native tropical plants and fauna surround the beachfront colonial-style property. The resort is family friendly and has many activities for all ages. The property is only 10 minutes from Puerto Plata and 20 minutes from the airport. The rooms are modern and stylish and offer many standard amenities. Rooms are air-conditioned and include daily minibar service and complimentary Wi-Fi. Many of the rooms feature a private balcony to enjoy your morning coffee or drinks under the stars in the evenings, with views of the gardens, pool or ocean. With four main restaurants, you will find both a la carte dining and buffet options whichever you desire. You can choose from classic Mexican cuisine to international dishes including sushi and Mediterranean. Snacks and cocktails are available all day at any of the bars and lounges situated throughout the property. Activities are numerous including Star Camp for the children designed with over 140 activities based on age ranges that will keep them entertained for hours. You can spend the day at the beach snorkelling, windsurfing and kayaking or enjoy the sun while lounging by the pool with a cool drink in hand. There are nightly shows and music performances in the hotels theatre. The resorts professional spa offers many treatments from facials to massage all created to bring complete relaxation and balance of body, mind and spirit. Every member of the family will have the vacation of their dreams creating wonderful memories for all.